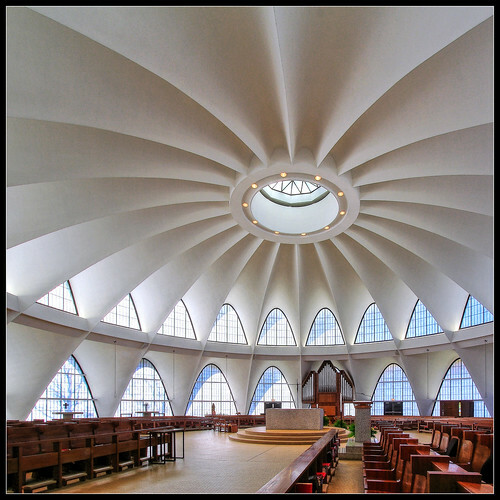 The following homily was preached on Sunday, March 6, 2016 (the fourth Sunday of Lent), at a service of Choral Evensong at the St. Louis Abbey, sung by the CSMSG choir as part of our continuing relationship with the monks of that Community. I officiated and preached, and we were all the grateful recipients of warm hospitality from the Abbot and brothers. “A good time was had by all!” I think this is one of the best things we do here at CSMSG, and I pray this relationship continues a long and happy one! Collect: Gracious Father, whose blessed Son Jesus Christ came down from heaven to be the true bread which giveth live to the world: Evermore give us this bread, that he may live in us, and we in him; who liveth and reigneth with thee and the Holy Spirit, one God, now and for ever. Amen. Everything just feels right there. His words resonate with me, and I suspect with a lot of people. There are places we go in life where everything just feels right. Monasteries seem especially able to communicate this. There is something fundamentally right about the work of God which is carried out here, something deeply beautiful about a community’s life ordered as a school of the Lord’s service. They are places which are resonant with the Spirit calling as deep to deep, where “the final revealing of the sons of God” often seems to be at the very brink. The church, the grounds, and most of all the members of the community themselves, impress themselves on the visitor as icons of the way things ought to be. I always find it remarkable how quickly visitors start to feel at home in a monastery, even on their very first visit; and I have to think that a large part of that is a response to the feeling that here, things are as they ought to be. Of course, this side of heaven, things are rarely as they ought to be, even in a monastery. And in fact, the more things appear to be just as they ought, the more vigilant we must be, not to let evil and vice creep in unnoticed. Parishes are the same way, and families; cities and states and nations too. It is often very easy for a generous visitor to see a new country as the portrait of its own ideals. But its citizens can always tell a different story. Why is it that visitors see the good, while citizens see all the rest? Are they simply deluded? I don’t think so. I think rather that there is simply something about being a guest in a place, that clears the vision and allows the good to shine through. Likewise, there is something about being a citizen of a place that highlights its weaknesses, its challenges, and the work that still has to be done. The world wants to see contradiction and hypocrisy in the Church because so far we do not yet exhibit the holiness and perfect unity in love which our Lord promised and for which he prayed the night before his death. Likewise we can be dissatisfied with our vocations, wherever they may plant us, because it is much easier to see grace at work abroad than in the complicated and confusing humdrum of our own lives. The place where everything is as it ought to be, where “everything just feels right,” is very frequently somewhere else, somewhere farther on ahead of us, which we may visit from time to time but cannot yet call our own. What, then, are we to do? How do we answer the world? How do we resolve our own contradictions? Where can we go to be finally and forever at home? Our lessons tonight suggest that the best answer to these questions is to be always at prayer. All may not be right with the world or with ourselves, but in prayer we are moved by the Spirit into the presence of our heavenly Father, who is our eternal home. In prayer the two contradictory visions of our spiritual sight overlap, and we see in three dimensions. Our sin: not just our fall from glory, but also the occasion of our redemption. Heaven: not just a promise for the end of time, but also our strength and nourishment even now as the Spirit moves within us. Though the world about us fall to pieces; though we ourselves be racked by temptation, disquiet, and uncertainty; in prayer we are joined to Our Lord’s own eternal offering of himself to his Father, even as we are also joined to the Father’s gift of his Son for us and for all creation. In prayer, we are always at home — even if we be thousands of miles away, even if we be separated from our families or broken from their fellowship. In prayer, the groaning of whatever suffering we experience in this present life is joined to the agony of Our Lord and the birth pangs of the Spirit. In prayer we begin to be made new. All might not be right with this world, with ourselves, with whatever place it is we are. Yet in prayer, however agonizing it might be for us, in prayer we are at home: everything is as it ought to be, we are on the doorstep of heaven, and the One who dwells there recognizes us for his own. As Lent draws on towards Holy Week and the Paschal Mystery, let us resolve to be people of prayer: which is to say, let us be guests of heaven. Let us throw ourselves on Heaven’s hospitality. And so heaven’s Host will wash our feet, bind our wounds by his own, give us his peace which passeth all understanding, and feed us with his own Body and Blood. So we shall be both guests and citizens at once, heirs of his eternal life. The following sermon was preached on Sunday, February 21, 2016 (the second Sunday of Lent), at the Church of St. Michael & St. George. Services today, as all through Lent, begin with the Decalogue (Ten Commandments) and Penitential Rite (Summary of the Law with Confession), in which each commandment is read aloud followed by the whole congregation saying together, “Lord have mercy and incline our hearts to keep thy law.” Following all the commandments we say the general confession and hear the words of pardon. This takes the place of the Confession later in the service. Collect: O God, whose glory it is always to have mercy: Be gracious to all who have gone astray from thy ways, and bring them again with penitent hearts and steadfast faith to embrace and hold fast the unchangeable truth of thy Word, Jesus Christ thy Son; who with thee and the Holy Spirit liveth and reigneth, one God, for ever and ever. Amen. A few years ago I met a priest who had been a guest preacher at Eton College Chapel in England. As you may know, Eton College is one of the world’s great boarding schools, where boys from 13 to 18 years old have been educated in the shadow of Windsor Castle since the reign of Henry VI, in 1440. The school has sometimes been called “the nursemaid of the empire,” and it has been the alma mater of monarchs, statesmen, and churchmen alike (both the present Prime Minister and Archbishop of Canterbury are alumni, to name two examples). Since its founding, daily worship has been offered in the school chapel, according to all the seasonal changes and chances of the Book of Common Prayer. This preacher whom I met had arrived at the chapel early, since he wanted to check a reference in his sermon against the Prayer Books in the chapel seats (which of course were then — and still are! — the Book of Common Prayer of 1662). 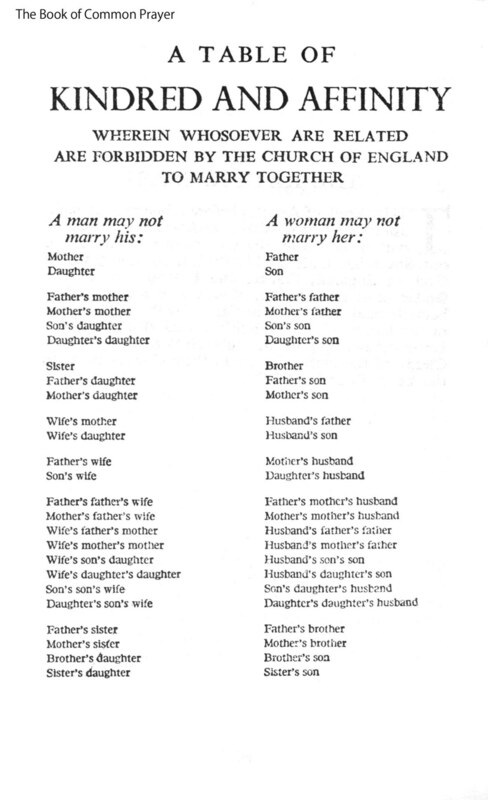 He chose the nearest prayer book, and on opening it, the pages fell naturally to the “Table of Consanguinity,” the page that lists all the persons in a person’s family whom he or she is not permitted to marry. Of course the boy was making a wordplay on the lines we just spoke earlier this morning: they are part of our “Penitential Rite” which we use at the beginning of our services during Lent, and which are spoken with at least the same frequency in the English prayer book. “Lord have mercy upon us, and incline our hearts to keep this law.” Whether reciting the Ten Commandments or steeling ourselves against the charms of Grandma, it’s a wonderful prayer to keep in our back pockets and at the tips of our tongues! In our Gospel reading today, Jesus is also engaging in a little wordplay. First he calls Herod a fox, which is funny enough: this Herod was not his father: his father was the Herod who talked himself into a fruitful alliance with the Romans, who had engaged in massive building plans, negotiated with the three wise men, and left his kingdom far stronger than he found it. This Herod, the son, was no great politician. He had presided over the fracture of his father’s kingdom into much smaller bits, an outright takeover bid by new Roman Governors, and couldn’t manage to keep a lid on the intrigue in his own house let alone his kingdom. Jesus is making fun of Herod by calling him a sly fox. But then he continues, by referring to himself as a hen! Foxes and henhouses, the implication is clear: Herod is out to get him. Jesus reflects that as much of a fool as Herod might be, Jerusalem will still be his doom, even as it was the doom of all the prophets before him. “Blessed is he who comes in the Name of the Lord.” First of all Jesus is referring back to Psalm 118, one of the great liturgical psalms used in Jewish feasts, in which the whole people of God is summoned to praise the Lord, “whose mercy endureth forever.” “Blessed is he who comes in the name of the Lord” is one of the concluding verses of that Psalm, and serves to point the whole singing congregation towards the saving activity of God on behalf of his people. It is one of the great summaries in Scripture of the whole purpose of the prophets. Jesus’ wordplay here is not just the tired and somewhat caustic commentary it initially appears to be. His wit plays the whole prophetic and religious tradition of his people off of his own upcoming triumphal entry, passion, and crucifixion. In a moment of sly humor, Jesus makes a wonderfully cheeky comment about his own future and the nature of his gospel. When we sing “Blessed is he who comes in the name of the Lord” in church we are doing two things: first, we recall the act which Jesus accomplished on our behalf upon the cross and give thanks for the salvation it works for us; and second, we also turn our attention towards the coming Eucharistic Prayer, and recognize Jesus’ presence among us under the sacramental signs of bread and wine. In effect, we are saying, “Thank you for what you did for us on the cross; and thank you for the nourishment we are about to receive, the fruit of that same redemption.” Singing, “Blessed is he who comes in the name of the Lord” locates us as recipients of God’s grace, and throws us on the Name of Jesus as the one through whom we receive it. But this isn’t all. There is more wordplay to offer. “Blessed is he who comes in the name of the Lord.” It is a witty remark by Jesus which reflects on prophetic tradition and predicts his own triumphal entry and crucifixion. It is pithy line by which you and I remember his sacrifice and prepare to receive the ongoing nourishment of his body and blood. But it’s not just a way of reflecting on the past and preparing for the present. It is also an anticipation of the future. “Blessed is he who comes in the name of the Lord.” You and I, with all the baptized, have put on Christ as a garment by the power of the Holy Spirit. Day by day, in Lent especially by our individual disciplines, we are being conformed to his image and growing into the fullness of his stature. When God the Father looks at each of us on Judgement Day, He will see the likeness of his Son and the virtue of His sacrifice, not our own meager efforts. On that day, as we enter into the joy of our Master, the whole chorus of angels will sing of each one of us, “Blessed is he who comes in the Name of the Lord,” and all heaven will laugh at how well the wordplay fits for each of the redeemed. “Blessed is he who comes in the name of the Lord.” What am I trying to say with this whole wandering series of reflections on wordplay? Only a very simple point, which some of you have been hearing me make all week long. That is, that the Christian religion is not a sad or a depressing thing. Sure we discipline our souls and bodies, especially in Lent, and of course we mourn our sins. But the whole brilliant wonderful reason for doing all this is that, thanks to God, our sins do not have the last word, they cannot speak the last judgment against us. The power of sin and death have been defeated by him who faced them on our behalf. And all that’s left, he deepest truth about heaven and earth and each one of us, far deeper than our sin and failings, is the mirth, the good cheer, the laughter of God.